V-belts and high capacity wedge belts and pulleys remain the most widely used and are proven to offer dependable service, with minimum maintenance. The largest stock range found anywhere in Europe, ensures immediate availability. synchronous drive belt systems offer more HP/KW, higher torque, lower speeds and smoother quieter operation. They deliver positive trouble free power transmission in torque ranges only previously serviced by chain and gear components. Our timing belt systems offer the best possible technology for synchronous drives, allowing excellent mechanical efficiency, resistance to high and intermittent overloads together with low fitting tensions. Poly-V belts also known as ‘ribbed’ belts are ideally suited for high speed and or high drive ratio applications, that conventional V-belt drives are not suitable for. They offer smooth, vibration free performance on a single compact drive belt, which is resistant to heat and abrasion, leading to longer life. Roller chain and sprockets provide high power synchronous drive systems, suitable for a wide range of applications and are available in materials such as steel, stainless steel and nickel plated. They are constructed from high quality materials and are finished to tight dimensional tolerances and permit the functioning of a precision gear system. Flexible and rigid couplings form a vital link between mating components covering virtually any industrial application, from low power low speed general purpose drives, through to high power high torque applications. Flexible couplings cater for misalignment, absorb shock loads and damp out vibrations, while rigid couplings provide a convenient method of rigidly connecting the end of shafts. Weld-on hubs are manufactured from steel, they are drilled, tapped and taper bored. The outer diameter is machined with a shoulder that provides a location point when welding to its mating component. Bolt-on hubs are manufactured from cast iron, drilled, tapped and taper bored. The outer flange has pre-tapped threaded holes for fixing to a fan rotor, plate wheel and various other components. 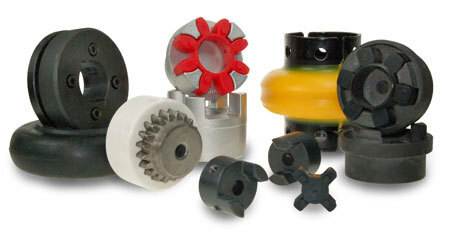 Both weld-on and bolt-on hubs accept a standard taper bush. Taper bushes and adaptors form the most convenient and cost effective method of fixing power transmission components to a mating shaft, without the need for any machining process. Designed for use with V-belt, timing belt and poly-V belt pulleys, chain sprockets, couplings, hubs and adaptors, the taper bush forms a vital link between shaft and the drive component. Adaptors and locking elements are available for use in a parallel bored component. We have a team of engineers, designers and dedicated account managers who can help in selecting the most appropriate belts and pulleys. Our product offering is backed up by our team of engineers, designers and dedicated account managers who can help in selecting the most appropriate coupling.